Any fabric used in clothing or home decor must have finished edges. No matter how carefully edges are trimmed or cared for, they will fray if not finished correctly. That means the fabric must be twice-folded so that sturdy fabric is attached to sturdy fabric, not to a cut edge. For many purposes, a simple hem will suffice. However, when finishing fine linens, we want the hem to be invisible from the front side; and for the finest linens we want the hem to be invisible from both front and back, making the item reversible, at least along the finished edges. The first photo to the left shows front and back of a machine-hemmed tablecloth. A thin line of stitching shows on both sides. Most mass-produced items use this stitching. Look at the cuffs of your shirt. The second photo shows front and back of a hand-hemmed tablecloth. Longer stitches are on the backside, picking up only a thread or two from the front. This still results in a definite front and back, or inside and outside; but it is much more difficult to see the front stitching. Haute couture, hand tailored clothing will always use hand-hemstitch to achieve a smooth, finished edge. But sometimes even hand-hemstitch is not good enough; the item needs to be equally finished on BOTH front and back. Several techniques have been developed: fringe, commonly used on towels and napkins (notice the rows of re-enforce stitching above the fringe, these prevent fraying above the fringe); hand-rolled hem, commonly used on fine fabrics, such as hankies; buttonhole-stitch, commonly used on scalloped edges, which don't hold their shape when twice-folded; and several variations of the drawnthread hemstitch, commonly used on many household linens. This is the stitch you see everywhere on antique and vintage linens; pillowcases, napkins, tablecloths, towels, etc. It's that simple, decorative outline of little lacy squares. The seamstress draws and removes threads in a line parallel to the edge of the fabric, where the twice-folded hem is to be attached. The remaining threads are gathered and wrapped together at even intervals. 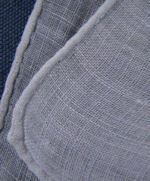 Edges above and below the line are overcast, including the folded edge of the hem. This will create a hemstitch that is incorporated into the lacy outline, the same on both sides of the item. In 1895 Karl Friedrich Gegauf invented the Bernina sewing machine. This machine very closely duplicated several stitchings that were formally only created by hand. Amongst these stitchings was the classic hemstitch. Many vintage linens were produced with the machine-stitched hemstitch and then further embellished with handmade lace and embroidery. The larger classic drawnthread hemstitch is a bigger and showier version of the hemstitch above. More threads have to be drawn from the fabric and the finishing involves more wrapping and overcasting. This hemstitch is enjoying a revival of popularity in higher-end linens on the market today. Its simple elegance fits well with almost any style. The Gallucci hemstitch is another drawnthread hemstitch variation. It is most often, but not limited to, finishing on fine Italian linen items. It usually consists of three drawnthread rows, two narrow with a wider center stripe. 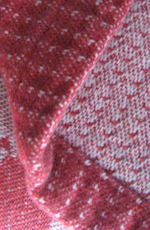 The outer rows show the lacy small-squares patterns with the hem attached to the outer row. The center stripe is different. After the threads have been drawn from the fabric, the remaining threads are gathered together to form a row of X patterns. Variations on the drawnthread lace hemstitch are endless. The drawnthread band may be of any width, the remaining threads may be formed into any pattern and combined with any other form of lace. When threads are drawn from both vertical and horizontal edges, open squares are created in the corners. 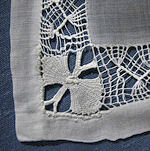 Each seamstress uses these squares to display her own special lace. The hanky to the left is just one example of possible combinations. The drawnthread band is about 1" wide with a complicated over-and-under pattern. A needle lace bird decorates each open corner. As you can see, the method of hemstitching is determined by the use and quality of the item. Obviously, the more labor-intensive techniques will be used on higher quality, and more expensive, linens. You can use the style and skill of the seamstress shown in the hemstitching as a determing factor when considering the value of an item. The photos here show a few of the pieces available from Hearts-Desires at the time of writing. Our site map to the left will guide you to various sections.